Puer (pǔ ěr普洱) is a prefecture-level city in southern Yunnan province (yún nán shěng 云南省), People’s Republic of China. The name Puer dates back to 1729, but was changed to Simao (sī máo 思茅) in 1950 after the Communist Revolution. In 2007, the original name of Puer was restored. The urban administrative center of Puer is Simao District, which is also the former name of the city itself. Puer is famous for its Puer tea (pǔ ěr chá 普洱茶). A major downturn in the price of tea in 2007 caused severe economic distress in the area. The price of Puer has since recovered and Pu’er tea still contributes much to the income of the area. The whole city covers an area of 44221.34 square meters, and is bound by Laos and Vietnam to the southeast and Burma to the southwest, with a border of 486 kilometers. 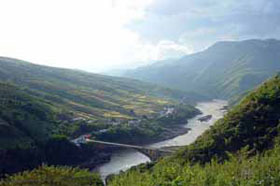 It is an important gateway to southwest China, with 18 land border crossings, and three water passes - Lancang River (lán cāng jiāng 澜沧江), Hong River (hóng hé 红河) and Nankang River (nán kàng hé 南亢河) – to other countries in Southeast Asia. The city has a population of 2,370,000, among which are 1,440,000 minorities. There are 36 minority groups in Puer, with the Hani (hā ní 哈尼), Yi (yí 彝), Dai (dǎi 傣), Lahu (lā hù 拉祜), Wa (wǎ 佤), Bulang (bù lǎng 布朗), and Yao (yáo 瑶) as the main ones. It includes 1 district: Simao, 9 autonomous counties: Ning'er Hani and Yi Autonomous County (níng ěr hā ní zú yí zú zì zhì xiàn 宁洱哈尼族彝族自治县), Mojiang Hani Autonomous County (mò jiāng hā ní zú zì zhì xiàn 墨江哈尼族自治县), Jingdong Yi Autonomous County (jǐng dōng yí zú zì zhì xiàn 景东彝族自治县), Jinggu Dai Autonomous County (jǐng gǔ dǎi zú yí zú zì zhì xiàn 景谷傣族彝族自治县), Zhenyuan Yi, Hani and Lahu autonomous County (zhèn yuán yí zú hā ní zú lā hù zú zì zhì xiàn 镇沅彝族哈尼族拉祜族自治县), Jiangcheng Hani and Yi autonomous County (jiāng chéng hā ní zú yí zú zì zhì xiàn 江城哈尼族彝族自治县), Menglian Dai, Lahu, Wa Autonomous County (mèng lián dǎi zú lā hù zú wǎ zú zì zhì xiàn 孟连傣族拉祜族佤族自治县), Lancang Lahu Autonomous County (lán cāng lā hù zú zì zhì xiàn 澜沧拉祜族自治县), Ximeng Wa Autonomous County (xī méng wǎ zú zì zhì xiàn 西盟佤族自治县). The Seat of City Government: Yueguang Road, Simao District. Puer is located in southwestern Yunnan, on the lower reaches of the Mekong (known in China as the Lancang), with the bordering prefectures being Yuxi (yù xī 玉溪) to the northeast, Honghe (hóng hé 红河) to the east, Xishuangbanna (xī shuāng bǎn nà 西双版纳) to the south, Lincang (lín cāng 临沧) to the northwest, and Dali (dà lǐ 大理) and Chuxiong (chǔ xióng 楚雄). It also shares borders with Vietnam (Dien Bien province), Laos (Phongsali Province), and Burma (Shan State), being the only prefecture in Yunnan to border all three countries. As with much of the province, mountainous terrain dominates its administrative area, covering 98.3%. Elevations range from 376 to 3,306 metre (1,234 to 10,846 ft). Located at an altitude of just above 1,300 m (4,300 ft) and within a degree south of the Tropic of Cancer, Puer has a humid subtropical climate (Köppen Cwa), with warm days year-round, although from January to April, temperatures cool off sharply at night, yet frost is rare. From June to August, rainfall is particularly common and relative humidity averages in the mid-to-upper 80%, pushing sunshine levels to 30% of the possible total. The coolest month is January, with a daily average of 12.5°C (54.5°F), while the warmest is June, at 22.3°C (72.1°F). More than 85% of the annual rainfall occurs from May to October. Pu-erh tea, also spelled as Puer tea is a variety of post-fermented tea, specifically Dark tea, produced in Yunnan province, China. Post-fermentation is a tea production style in which the tea leaves undergo a microbial fermentation process after they are dried and rolled. This is a Chinese specialty and is sometimes referred to as dark, or black tea (this type of tea is completely different from what in West is known as "black tea", which in China is called "red tea"). There are a few different provinces, each with a few regions, producing dark teas of different varieties Those produced in Yunnan are generally named Puer, referring to the name of Puer county which used to be a trading post for dark tea during imperial China. Puer is available as loose leaf or in various compressed forms as a tea brick. There is also the differentiation of ripened and raw types. The ripened type refers to those varieties that have gone through an accelerated post-fermentation process, while the raw types are those in the process of gradual darkening through exposure to the environmental elements. Certain selections from either type can be stored for maturity before consumption. That is why some are labeled with year and region of production. The Puer Tea exhibition garden is situated on Yingpan Mountain (yíng pán shān 营盘山), which is 29 kilometers (18 miles) from downtown Puer. The garden consists of the Puer Tea Museum, the Puer tea making workshop, a tea-picking zone, a tea appraisal garden, and other facilities that give a general history of Puer Tea’s evolution, and production. Qianjia Zhai Scenic Area (qiān jiā zhài jǐng qū 千家寨景区), located in the northeast of Zhenyuan County of Puer City in Yunnan Province, is the provincial-level scenery area. It consists of 49 scenic spots with the total area of 44 square kilometers. Qianjia Zhai Scenic Area features beautiful water, majestic mountains, quiet forest and extraordinary scenery. Wild tea trees: According to the experts, the top tea tree, which is 18.5 meters high and 2700 years old, is the oldest and biggest wild tree that ever been found so far. It’s situated on Ailao Mountain which rises more than 2600 meters above sea level. At the top of the mountain, tourists can enjoy an unparalleled scene of natural beauty unfolded in front of their eyes. Meanwhile, As Yunnan is recognized by the scholars at home and abroad as the home of tea trees, the discovery of the top wild tea tree helps scholars to make scientific research on the origin, feature, growing environment and development of tea. 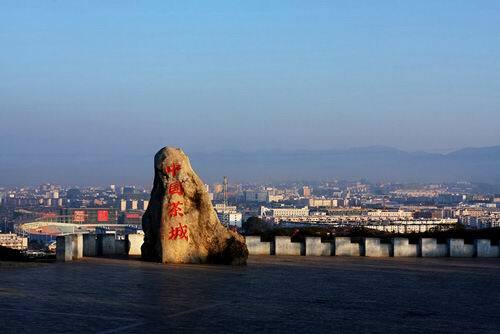 Qianjia Zhai Ancient battlefield sites: In the Qing Dynasty, a large number of people escaped to the mountain in order to keep away from the war. They built their houses in the forest and thousands of families once lived there. So it was named Qianjia Zhai. At the present, there are still remains of the houses. The houses with ancient trees touching the sky bears witness to a period of history. The Feilai Temple (fēi lái sì 飞来寺), which was built in the Ming Dynasty, is constructed of cement and wood. There are clay sculptures in it, such as Guanyin Bodhisattva and gods. Though the temple is a little bit shabby, there are still a continuous stream of worshipers come to the temple and fall down in adoration before Buddhist images because of its long history. It is said that the wooden beams could not be carried on the mountain because the mountain was too high and the path was too narrow and steep. However, it was rather surprising that the wooden beams flew on the mountain overnight. It was said that the wooden beams were under the help of the god. So it is called the Feilai Temple. Inside, there are sheer peaks and grotesque rocks, and caverns formed by karst geomorphology. Transportation: There are several buses from puer City to Zhenyuan County. 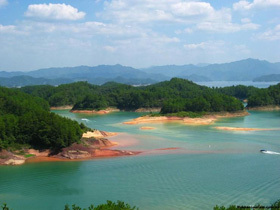 Meizi Lake (méi zǐ hú 梅子湖), located four kilometers southeast of Simao District of Puer City, used to be a reservoir. It was opened to the public as a park in the year 1982. The lake measures 3.5 kilometers long with an average depth of 15 meters. It covers a water area of 600 mu with 6.6 million cubic meters of water storage capacity. Outside the gate of the park, there is a majestic aqueduct. Inside the park, tnhere are small-scale zoos and holding ponds. The park is well served with entertainment facilities and surrounded by verdant trees on the lake side. As people climbed to the top of the hill, the lake and the hills add radiance and beauty to each other. In the lake, there are both automotive cruise ships and pleasure ships that can be pedaled. By the lake, there are some towers, pavilions, buildings of ancient style, long art corridor for poets, scholars and calligraphers and the multifunctional holiday resorts. The park, surrounded on four sides by verdant mountains, is full of the beauty of spring. Sailing on the lake, people will enjoy the scenery of the reflection of the mountains and trees in the clear water. 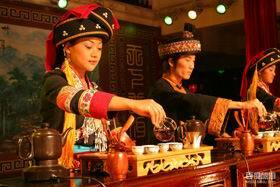 During the nap in the pavilions, people can have a taste of puer tea. And have a taste of the hot and sour fish cooked with water of the lake is also a good choice. 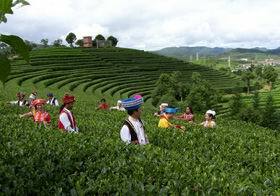 Tea Road was the "Silk Road" of the south for material communication and trade since the Tang dynasty and being glorious during the Qing dynasty and the Republic of China period which leads Puer to Kunming, Tibet, Lancang, Burma, etc. The ancient Tea Road which promoted the brilliant tea business in Puer area is kept very well in three places. Another one is the Tea Road in Democracy Village, Fengyang county which is a stone path of 2 km long winding up the mountain in half primitive forest. The deep footprints of the horses in the path showed the hard days when people changing tea for horses and other needs. 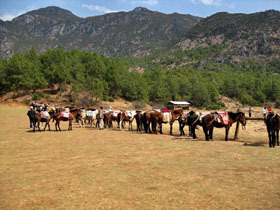 Walking up along the path, people will experience the danger and hardships of the Horse Group, groups of people who transported tea with horses. The third one is the site in Peacock Patio, Mo Black Town which is about 10km with some horse stops alongside and the clear horse footprints, showing the prosperity of the Tea Road. The image of the scenery "bells ringing as the horse groups passing" was the real life before 1950s which can only be seen in the films now. No bells, no horses, the road is so quite. However, the melodious bells and the beautiful songs are still vivid. Nowadays, the Puer people travel over the mountain, carrying the best tea by strong horses and go far away for trade in March every year. Tips: Replaced by the modern transports, the horse group has disappeared, and so is the ringing bell. Lancang River, rising in Tibetan Plateau which is the largest plateau in China runs through six counties from Jingdong Country to Puer. Then it flows through Xishuangbanna. Lancang River, which is called Mekong River out of the country, joins Laos, Burma, Thailand, Cambodia and Vietnam, and finally debouches into Nanhai, flowing about 4,880 kilometers. Lancang River, acclaimed as “the oriental Danube”, is the main waterway artery of communications between China and Southeast Asian countries. As the travelling route of Lancang River has been opened, it provides tourists with aquatic tourist route along Lancang River (Mekong River). 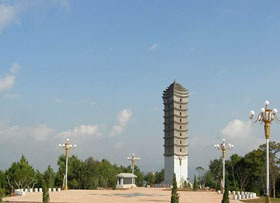 Nayun Ancient Town (nà yǔn gǔ chéng 娜允古城) is located in the Menglian Dai and Lagu Autonomous County. It is the last Dai ancient town, and has been listed as a famous Dai historical and culture city. With a history of 700 years, the town is regarded as a holy place by the Dai people of Southeast Asia. There are buses that run from Puer to Menglian every hour. Travel time is about 7-8 hours. Upon arrive in Menglian County; you can take an electronic car (CNY 2.00) to the town. 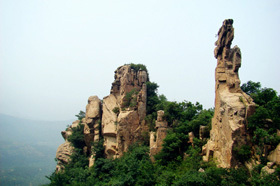 Awa Mountain (ā wǎ shān 阿瓦山) is located in Ximeng County. The mountain is well known for its Cloud Sea, in winter and spring. 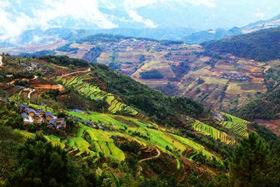 Besides the cloud sea, the bamboo houses, terraced fields and Musa trees are also attractive and beautiful. Sea clouds in winter and spring is the most fascinating scene of the Awa Mountain. After the clouds disperse, bamboo houses in villages, terraced fields and Musa trees are exposed and the Awa Mountain looks even more tranquil and beautiful. Puer is 570km from Kunming, the capital city of Yunnan Province. There is no train station there at present. The main method of transportation to this city is by bus. Puer airport is situated at the south foot of the Wuliang Mountain (wú liàng shān 无量山), only 2 kilometers west from the city’s outskirts. There are direct flights to Kunming everyday, which last about 40 minutes. If you travel from other city to Puer, it is easy to transfer at Kunming. It takes about 5-6 hours to get to Puer from Kunming by bus. The cities two main bus station are located at Wuyi and South Zhengxiang Road.